No amount of rain could have made this wedding any less full of love or any less beautiful. This Saturday, we had the honor to serve Shane and Addy on their wedding day as they were surrounded by their closest friends and family. Robin Hill Farm and Vineyard was the perfect backdrop for their special day! Addy is a country girl at heart, so it was only fitting that her and her bridal party wore the prettiest cowboy boots for their wedding attire! Shane is a Navy Diver so maybe God knew that he needed a little more water on this day. It rained on and off but Shane and Addy were so enthusiastic about going out for more portrait time, they didn’t even care! They were so in love and just ecstatic to be married – it was like the rain wasn’t even there. Addy and Shane did not originally plan to have a first look, but because of the downpour forecast that was scheduled to happen right after the ceremony, they opted to have a very intimate first look in the vineyard. They were so happy that they got to have this opportunity to themselves and enjoy just a few moments of quiet and privacy before their ceremony! And for all of you brides and grooms who are afraid that your groom is not going to cry when you walk down the aisle if he sees you before the ceremony, here is another example, yet again, that that is just simply not true! If your man is a cryer – he will cry both times! Or in Tony’s case, multiple times just through out the day, period! Congratulations, Addy and Shane! Your day was absolutely beautiful! The perfect definition of a true Southern Maryland wedding. 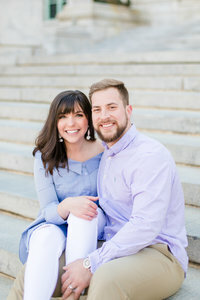 Thank you Shane, for your service and sacrificing your time so that we can do what we love to do – which is photographing YOU get married to your true love! You both are going to have the most amazing time on your Disney cruise. We love you! Thank you to the following vendors for making this day just absolutely stunning! To view more weddings at Robin Hill Farm and Vineyard, browse the links below!